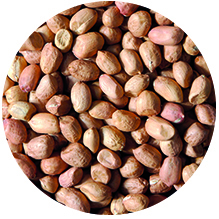 Groundnuts, popularly known as peanuts & monkey nuts, are actually legumes, belonging to the same family of beans & peas. However, they share many of the same health benefits as other tree nuts. Peanuts grow on all continents and are cultivated in tropical & subtropical climates. Peanuts contain monounsaturated and polyunsaturated fats that keep the heart healthy. Peanuts are an extremely high source of plant protein. Contain high concentrations of the antioxidant polyphenol. A rich source of minerals like magnesium, phosphorus, potassium, zinc, calcium, sodium. One of the most popular snacks in the world. Peanuts are used in many different culinary applications around the world, in sauces, spreads, as a garnish etc.